It is the most desirable Ferrari ever built, according to many experts, and it will be on view for the first time in Ireland at the AXA National Classic Car Show this March. The 1959 250 GT Berlinetta SWB – which is unique in Ireland – will appear on the Ferrari Owners’ display stand and undoubtedly is one of the highlights of this year’s show at the RDS in Dublin. Many people will recognise the car as the same model that starred in the hit 1980s comedy movie ‘Ferris Bueller’s Day Off’, in which the two main characters managed to completely destroy the Ferrari after taking a joyride into downtown Chicago. 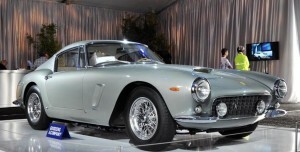 Serial Ferrari collector and British TV and radio presenter Chris Evans also owned a 250 GT SWB, which he sold in 2008 for what was at the time a world record breaking price of $10m. In 2015 this was eclipsed when a private buyer paid $16m for the same model. The 250 GT SWB Berlinetta was designed by an elite team of Ferrari engineers including Giotto Bizzarrini, Carlo Chiti, and Mauro Forghieri, the same team that later produced the famous 250 GTO. What they built was one of the most notable GT racers of its time. Utilising a short wheelbase for better handling, the car was innovative and disc brakes were a first in a Ferrari GT. The superior braking and a combination of low weight, high power, and a well-sorted suspension made it a very competitive offering. Only 176 examples were built with both steel and aluminum bodies used in various road and racing trims. Engine output ranged from 240-280bhp, allowing it reach speeds in excess of 150mph. The ultimate development of the all conquering Ferrari 250 SWB was introduced in 1961, with upgraded engines, suspension and further lightening measures. The SWB Berlinetta claimed GT class of the Constructor’s Championship for Ferrari in 1961.